On Aug. 8, the board voted unanimously to place Worrell on paid administrative leave as he faces criminal investigations into misappropriation of public funds. That particular board action was later rescinded because the action was not on the agenda as required by law. Board members also expressed concerns that they had been provided inaccurate information by its legal counsel, Ray Biering. During the Aug. 8 closed session meeting, Supervisor Debbie Arnold asked Biering twice if Worrell had retirement benefits paid by the IWMA that could be recovered if he was convicted of a felony, Arnold said. But Biering told the board Worrell had no benefits. In 2006, the IWMA entered into a contract with Worrell that provided retirement benefits including 19 percent of Worrell’s basic salary that was paid into a retirement program. Two days after a Cal Coast Times article reporting on the allegations Biering appeared to have misled the board into voting to accept Worrell’s retirement. Worrell submitted a letter of resignation to the IWMA. 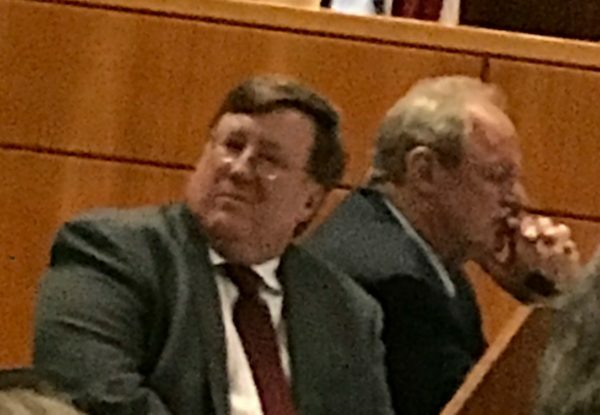 Attorney Jefferey Minnery, filling in for Biering, informed the board that Worrell had officially resigned Aug. 23, so that voting against the resignation was moot. Several board members then asked how they could freeze funds the IWMA had paid into Worrell’s retirement. Minnery recommended against taking any action. “You do not have the right to claw that back,” Minnery said. Minnery explained that the law was new and he recommended that if it is determined Worrell committed felonies in his management of the IWMA, the IWMA board could attempt to get the monies back civilly at that time. On Wednesday, the board voted 7-4 to appoint Michael Giancola as interim manager, with Supervisor Bruce Gibson, Grover Beach Councilman Jeff Lee, Pismo Beach Councilwoman Sheila Blake, and San Luis Obispo Councilman Aaron Gomez dissenting. The executive committee had proposed three applicants for manager: former CEO of Orange County Giancola, former Grover Beach city manager Bob Perrault, and SLO County employee Ron Munds. Several public speakers questioned Munds’ suitability because of his involvement in supporting allegations made by Worrell and former IWMA contractor Charles Tenborg in a lawsuit against CalCoastNews and two reporters. The board asked the applicants six questions each before selecting Giancola as the IWMA’s interim manager. Giancola, who will receive a rate of $152,000 a year, waived his right to retirement or health benefits. While it’s good to hear that the interim manager might be a “good guy,” that really doesn’t address their needs for that position. He’s likely going to be a desk jockey, and Worrell being a desk jockey is what got them in much of the trouble they find themselves. The interim guy is the former Admin Officer of Orange County, so you know his solution to any problems he finds is going to be, “more staff!” and what they actually need is less, and better, staff. Let’s look at Worrell. 150K per year plus a pile of benefits all total up to about 250K per year in total cost. That’s $5000 a week! With his time off of over 50 days a year, he was “working” an average of 4 days a week. Of those 4 days, maybe he did actually 20 hours of actual work in a week (if we don’t count all his online shopping with the IWMA credit card as work). $5000 per week and 20 hours maths out to about $250 an hour. Do you think, in 24 years working there, there was ever a single hour where he did anywhere close to $250 worth of work? Of course not. The contractor collects household hazardous waste for disposal for probably two or three months. Most of it is paint and pesticides, with some batteries and old solvents thrown in. They dispose of this by making up “lab pack” drums, where the small containers are packed into larger drums with absorbent materials around them. Let’s say the contractor collects enough toxic stuff to make up 20 lab packs in a two-month period. The US Department of Transportation specifies how much stuff you can put in a drum. However, instead of making 20 lab packs, the contractor packs these items into 30 lab packs. Boom, he is now charging IWMA for 30 drums when he should be only charging for 20, so his profit just went up 50 percent and IWMA’s cost also went up 50 percent. No one is going to catch him, because no one is watching him pack those drums or auditing his lab packs. This is exactly what the IWMA manger should be doing – getting out from behind his desk and auditing the actual waste volume being collected and disposed, and not just trusting the contractor’s word on it. But, since they keep hiring desk jockeys, this won’t happen. The interim manager may realize this needs to happen, but he’s not going to recommend that a “manager” get his hands dirty – heaven forbid! He’ll recommend they add a technician to do the work that the manager has plenty of time to do. Great. What does the manager really have to do? Write up a dozen grant proposals every year? That’s one whole task per month! Pay the bills. Renew contracts. This really isn’t sounding like a full time job to me. What they should do is hire a qualified consultant to do the manager’s job. Then they would only get billed for the time actually needed to do what has to be done. 20 hours a week at about $75 an hour would cost $1500 a week instead of the $5000 a week Worrell was costing them. But they hired an interim who is not going to point any fingers or bring up any uncomfortable details. They want to put the last 20 years quietly to bed. They hired someone who will help them do that and will perpetuate and increase the bureaucracy that has already been created, and which has failed miserably. No, hazardous dude, what they did was put someone who is not part of the Adam Hill cronie squad in. The other two choices were Adam Hill’s. Now the BS gets cleaned up. We’ll see. I doubt that those three were the only three qualified people on the planet. I still predict that the outcome of the interim appointment will be a recommendation that, “more staff are needed at IWMA to prevent problems in the future,” which is complete nonsense. I think you hit a nerve -2 on your comment votes. I guess someone didn’t appreciate you mentioning all the things they are doing wrong! I wonder, will Ray Biering be held accountable for lying to the board? The only two comments on the last Tribune story about Bill Worrell and the IWMA. Karen publicly spanking these three and Adam Hill’s ego coming back with his smoke and mirrors spin doctor game. Adam, sometimes it’s better to just sit back and not say anything than to continue to prove what has been so very documented about you. I must not have enough coffee this morning, I seem to be lost on the above post it runs together and I don’t see who is talking about whom. “Steal a little, and they put you in jail. Steal a lot, and they make you a king.” I wonder if Bob Dylan was talking about San Luis Obispo? So , he has run for the hills, back to Florida, Cancun and no one at the top finds this concerning. So, right now we have his underlings running the show. The same people who are so intelligent and on top of their game that none of them spotted the red flags. So, now the County in the infinite wisdom under Wasde Horton want to put Ron Munds in charge. Wasn’t Mr. Munds one of the players that brought Bill Worrell on board and has been actively involved in the IWMA as an agency rep since its inception. Didn’t Ron Munds provide testimony in the Tenborg Trial against Cal Coast that was identified as inaccurate testimony in the third party investigation. On that note, has Dan Dow filed charges against the individuals who collectively conspired to provide perjured testimony to assist Mr. Tenborg in his lawsuit to secure money out of CalCoast – hence a conspiracy to commit a crime, a rico stature violation. Dan Dow has done nothing. Also, I note that the article reflects the fact that a governmental employee can lose their accrued pension if they are convicted of a felony. Thus, if Dan Dow actually does his job, all of the individuals who committed perjury collectively could lose their pension, but then again these are Dan Dow’s buddies. What money, what employee, he’s already gone, next. This public process with great oversight has left me scratching my head? Maybe we need to pay higher taxes and implement new fees to fix the problem, and I though lemmings were crazy? They have played the game, now we will see if they pay the price?